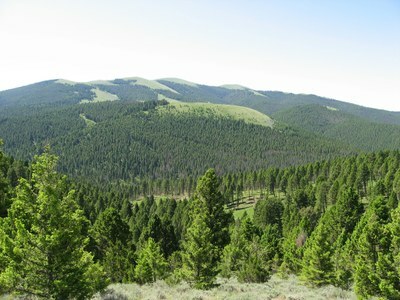 The Trust Land Management Division (TLMD) of the Montana Department of Natural Resources and Conservation (DNRC) administers approximately 780,000 acres of forest land. The TLMD is guided by laws and rules regulating timber harvest and forest management. These laws and rules specify objectives, regulate how and where timber harvest can take place, and establish standards to protect habitat for wildlife. One law directs the department to determine the quantity of timber that can be harvested from forested state lands each year, known as the annual “sustainable yield”. The DNRC is required to commission an independent third party to calculate the annual sustainable yield for forested state trust lands at least every 10 years. Annual sustainable yield (ASY) is the quantity of timber that can be harvested from forested state lands each year in accordance with state and federal laws and in compliance with water quality standards. A sustainable yield calculation (SYC) also accounts for the ability of state forests to generate replacement tree growth. The ASY is the amount of timber that the TLMD is directed to sell on an annual basis. The SYC is more than just an annual volume goal or target. The SYC represents a management level needed to maintain healthy and diverse forests and to meet other important ecological goals and commitments. It also provides a consistent and predictable supply of timber to Montana’s wood products industry. The SYC is calculated using a forest management model that considers the acres available for management and capable of growing timber, and projects how timber stands with grow and change over time. It incorporates all applicable laws and environmental commitments such as the State Forest Management Plan (SFLMP), Administrative Rules of Montana for Forest Management, and Habitat Conservation Plan (HCP). The SYC is calculated in million board feet (MMbf). This is a measure of timber volume. A typical log truck holds 4-5 thousand board feet (Mbf). The SYC Final Report has been posted. DNRC and MBG reviewed and considered all comments received. Responses to all written comments were included in Appendix J of the Final Report.